Based on reviews from 30 experts and 2,936 users. Learn how our rankings work or see our guide to Adidas Ace football boots. Updated Apr 2019. In 2015, Adidas shocked the football world when they decided to scrap all their boot lineups to make way for two new football boots, namely the Adidas Ace football boot for Total Control and Adidas X football boot for Complete Chaos. They worked with top football coaches in designing these new silos. According to the brand, this move was part of their effort to adapt to the ever-changing game of football. Back then, this seemed like an outrageous decision for the football boot manufacturing giant from Germany. Fast forward today, the Adidas Ace football boots proved to be one of the strongest and most popular football boot series for the brand. Below are some of the most notable technologies and features of this well-known football boot series. Laceless Adidas Ace football boots - The most distinguishing feature of this series is its laceless football boot, the Adidas Ace 17+ Purecontrol. By using a compression knit material, this Adidas Ace football boot is effective in keeping the foot locked in despite the absence of laces. External heel counter - A noticeable feature of the Adidas Ace football boot, specifically the Adidas Ace 15.1, is the external heel counter. For the first time, Adidas created a football boot that has its heel counter on the outside for exceptional stability on the pitch. One-piece construction upper - Some Adidas Ace football boots feature a one-piece upper. With a non-existent tongue, this upper design makes way for a larger striking surface and a cleaner touch on the ball. Mid-cut collar - The first Adidas Ace football boot to have a Primeknit collar is the Adidas Ace 16.1. With it, the company has made its way into the collared football shoe market taking on some high-top football boots from Nike head on. It is a revolutionary technology included in top-end Adidas Ace football boots designed to provide ultimate ball control. It is composed of three layers of engineered materials and has a distinct honeycomb appearance in the forefoot area. The NSG is made up of 3D dots that enable consistent control in both wet and dry weather conditions similar to Nike’s All Conditions Control (ACC). It is found in Adidas Ace 15.1, Adidas Ace 15.2, Adidas Ace 16.2 Primemesh, and other high-end Adidas Ace football boots. This innovative material covers the Primeknit of some Adidas Ace football boots. It adds texture and extra strength to some parts of the upper. This is the first ever football stud pattern made for both FG and AG surfaces. The mixed FG/AG configuration features ten conical studs and 36 lowered studs for total control and better traction on both grounds. The smaller studs also allow the player to have an enhanced underfoot control of the ball. Some of the top-end Adidas Ace football boots feature a Primeknit upper. It is made up of a soft and form-fitting material with a light-ridged layering across the forefoot. It also adds to the quality and durability of the Adidas Ace football boot. This cutting-edge technology was introduced in the Adidas Ace 15+ Primeknit model. Succeeding high-end Adidas Ace football boots, such as the Adidas Ace 16.1 Primeknit FG/AG, Adidas Ace 17+ Purecontrol, and Adidas Ace 17.1 Primeknit also have it on the upper. This technology is made up of synthetic fabric materials that are knitted in the upper of some Adidas Ace football boots. The purposes of the Primemesh is to provide excellent comfort and precise control, as well as eliminate or decrease break-in time. 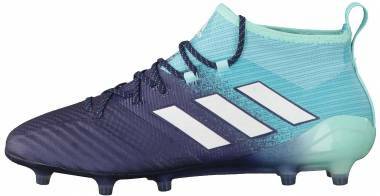 This mesh-based material is found in some of the lower-end Adidas Ace football boots like the Adidas Ace 16.2 Primemesh, Adidas Ace 16.3 Primemesh, Adidas Ace 17.2 Primemesh, Adidas Ace 17.3 Primemesh, and Adidas Ace 17.4 Primemesh. This lightweight chassis took inspiration from bridge designs and its ability to support huge amounts of weight. It creates a low-to-the-ground profile allowing the player to have more stability when making quick changes of direction and taking off for a sprint. A redesigned soleplate is featured in the 2016 Adidas Ace football boots. In comparison to its original version, the Ground CTRL 2.0 soleplate now has conical studs. They are useful in providing excellent traction and balance when making quick cuts and changes of direction. It also significantly reduced the weight of the football shoes. 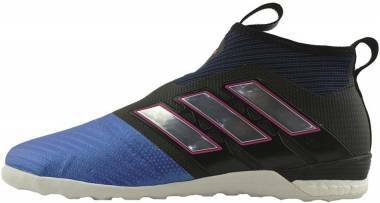 It is used in Adidas Ace 16.1 Synthetic, Adidas Ace 16.2 Primemesh, and Adidas Ace 16.3 Primemesh. For the 2017 Adidas Ace football boots, the brand used a more upgraded soleplate - Ground Control 3.0. Aside from providing excellent traction on both FG and AG playing surfaces, it also creates the perfect blend of ball control and lightweight performance. Adidas also added 6mm of Boost into the midsole and sockliner of the top-tier 2017 Adidas Ace football boot. This innovative technology allows more energy return as the foot strikes the surface. When it comes to performance, the Adidas Ace football boot is built for the playmakers; those who take the initiative on the pitch and control the game. It comes with the tagline, “Enforce Perfection”. Adidas Ace football boots are known to provide unbeatable ball control, touch, and fit. Below is a quick discussion of some of the best Adidas Ace football boots. 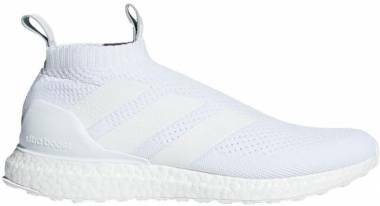 This is a laceless Adidas Ace football boot that combines the control aspect of a Purecontrol football boot with the comfort of an Ultra Boost running shoe. 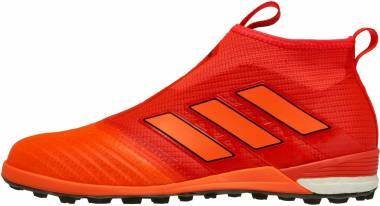 With its Primeknit upper, it looks like a Purecontrol football boot on the outside. However internally, it’s an entirely different story. Although the Primeknit material efficiently wraps the foot for that sock-like fit and feel, it lacks the internal support cage and the NSG on the surface. The bottom half of this shoe has the standard Ultra Boost outsole with the same Continental rubber. This mid-top football boot design is maintained in this limited-edition Adidas Ace football boot. It also has two pull tabs to help you get your foot in the shoe easily. The second generation laceless boot from the Adidas Ace 17 series is yet another treasure trove of innovation. Where the Adidas Ace 16+ Purecontrol lacked in terms of lockdown, the Adidas Ace 17+ Purecontrol made up with a better upper construction. The soft and pliable PrimeKnit upper together with an internal compression tongue do a good job of keeping the foot locked in place. The PureCut collar of the 2017 version is slightly higher than its predecessor. Adidas also added 6mm of Boost into the midsole and sockliner of this football boot. This allows more energy return as your foot strikes the surface. The upgraded GroundCTRL 3.0 soleplate maintains the FG/AG category by using low profile conical studs. With its altered fit and feel, this football boot is definitely an improvement from the previous one. This football boot is the laced version of the Adidas Ace 17 series. Its upper is made of Primeknit material covered by ControlSkin. With the addition of the laces, this shoe provides a more customized fit. This Adidas Ace football boot uses the Total Control outsole which has an all-conical stud pattern. This football boot also features an external heel counter which is helpful in keeping the heel locked in place. Pro football players like Mats Hummels and Manuel Neuer are seen wearing the Adidas Ace 17.1 Primeknit. This takedown Adidas Ace football boot features a Primemesh upper sans the Non Stop Grip dots. However, upon closer look, you will notice that there is an added texture on the surface. The outsole is made of standard TPU plastic. 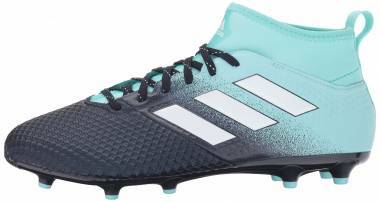 It has the same FG/AG stud pattern as the other Adidas Ace football boots. Despite its price point, this budget-friendly Adidas Ace football boot is still a cool looking shoe. Plus, it allows players to experience a mid-top football boot without breaking the bank. This Adidas Ace football boot features a stretchy mid-top collar that provides a sock-like feel on the ankle. The forefoot area of the upper has a textured detailing for that extra ball control while kicking and dribbling. The Total Control outsole is featured in this Adidas Ace football boot. It offers the player plenty of power and speed on turf field (TF) surfaces. Is the Adidas Ace series a successor of the Adidas Predator Instinct? No. It is not a successor of the Adidas Predator Instinct, but it is designed to fill in the space between the old and the new. It has the control aspect of the Adidas Predator as well as the lockdown of the Adidas Nitrocharge. What is an Adidas Ace football boot model that can fit wide feet? The Adidas Ace 15.1 football boots are generally built for wide feet. The fit is similar to Nike CTR360 and Adidas Predator. Which playing positions are recommended to use the Adidas Ace 15.1? 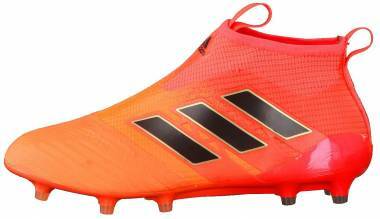 The Adidas Ace 15.1 football boot is best for midfielders and defenders. Players like Mesut Özil, James Rodríguez, Oscar, Manuel Neuer and Ivan Rakitić are among those who were seen using this football boot. How to clean the Adidas Ace 15.1 when dirt gets stuck on the bottom? You may use a jet of water from a hose and then air dry. What is the difference between the standard Adidas Ace 15.1 and Adidas Ace 16.1? The 3D Control Web, which covers most of the Adidas Ace 16.1 upper, has been redesigned. The lacing system is moved a little bit to the center creating more surface area on the football shoe’s strike zones. 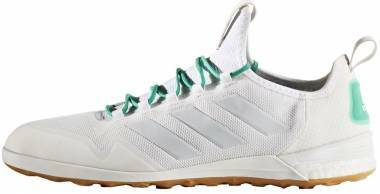 The Adidas Ace 16.1 has a new soleplate while still maintaining the FG/AG category. With the change to the updated GroundCNTRL 2.0 soleplate, the weight also dropped by 1.5 oz. What is new with the Adidas Ace 17 series? Adidas has made the collar of the Adidas Ace 17+ Purecontrol to be slightly higher than its predecessor. The Adidas Ace 17+ Purecontrol also has Boost technology sitting in the insole. This football boot also has an improved locked down sensation because of its internal compression tongue. How do you get your foot on the laceless football boots? The laceless Adidas Ace football boots come with built-in pull tabs. Angle your foot and slide it into the shoe. They also have shoe horns that will help you in squeezing your ankle into the football boot. What football boots from Nike and Puma are comparable to Adidas Ace football boots? Nike and Puma are two big names in the football boot arena. The Adidas Ace football boots can be compared to Nike Hypervenom, Nike Magista, and Puma evoPOWER football boots.